The Birth of Boston project is a partnership between faculty and graduate students in Northeastern’s History department, working with the Massachusetts Historical Society on using materials from their collections to investigate how historical narratives and data can be located geographically. The project is exploring mechanisms for linking multiple archival datasets and considering methods for curating and representing historical and biographical data. 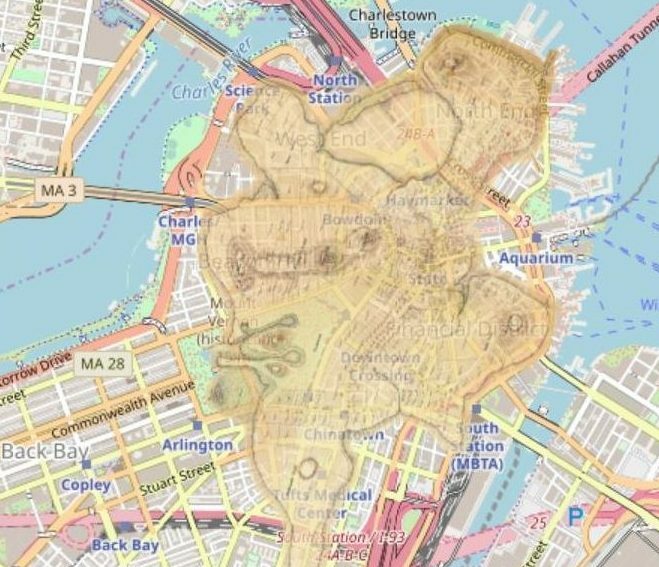 The Birth of Boston team has created a prototype interactive map of Boston in 1648 that allows users to click on land parcels to learn about each inhabitant that lived there. The map includes information on names, birth and death dates, occupations, family members, and events associated with the residents of each parcel. Read more about the pilot processes and outcomes here. Overlay of 1648 Clough Map on current map of central Boston. Image courtesy of MapWarper. This project builds on the pioneering efforts to reconstruct the social history of Boston by the amateur historians Samuel C. Clough and Anne Haven Thwing, both of whom worked in the early decades of the twentieth century. Clough, a trained surveyor, worked for decades on a topographical history of Boston that remained unfinished when he died in 1949. Thwing produced an index of approximately 50,000 residents who lived in Boston during its first two centuries. Their projects have been partially digitized by the Massachusetts Historical Society (where the Thwing and Clough collections reside) and the New England Genealogical Society. The prototype map as of November 2018 includes the 1648 Clough land parcel map, with information from the Thwing collection about the people who lived and worked there. The next phase of the BRC will greatly expand the number of historical maps that are available as reference points for datasets (such as census or land use data), and will enable the project team to use the 1648 map as a model for other historical maps of Boston. It will also expand the project’s scope to incorporate materials not covered by Thwing and Clough, including indigenous spatial histories and archives from Boston’s African American communities. In the long term, the team plans to develop walking tours and other pedagogical materials that will widen the project’s reach and use for students, researchers, and the public.